Welcome to dadmarketing! We’re glad you’re here. You guys hit the nail on the head w dads!! That is exactly why we launched our brand, DadFrat. Merchandise, brand, giftss onky for dad….celebrate dadhood 🙂 fatherhood. We are wet behind the ears young, and just entering the market. Open to any and all feedback. 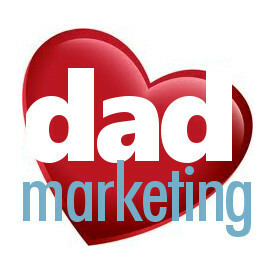 Great collection of information on marketing to dads. My online store http://www.mamamartina.com sells diaper bags to moms, however, I will be testing FB advertising to dads with babies to buy bags for their wives, girlfriends as gifts for mother’s day. I hope this is a good idea. We will see.